For the last two posts in this series on image recognition, I used an image which was topical, but little more, to try two Google services. 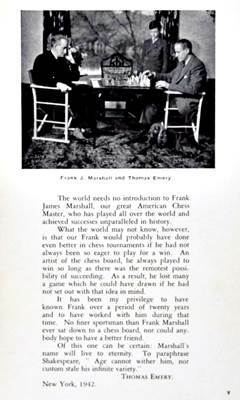 When Frank Marshall in 1942 wrote My Fifty Years of Chess, summing up an international chess career and 27 years possession of the United States chess championship, the book contained a great deal more of Thomas Emery than the preface which he supplied. Could image recognition tell me anything new about Emery's preface? No other sizes of this image found. The world needs no introduction to Frank James Marshall, our great American Chess Master, who has played all over the world and achieved successes unparalleled in history. What the world may not know, however, is that our Frank would probably have done even better in chess tournaments if he had not always been so eager to play for a win. An artist of the chess board, he always played to win so long as there was the remotest possibility of succeeding. As a result, he lost many a game which he could have drawn if he had not set out with that idea in mind. It has been my privilege to have known Frank over a period of twenty years and to have worked with him during that time. No finer sportsman than Frank Marshall ever sat down to a chess board, nor could anybody hope to have a better friend. Of this one can be certain: Marshall's name will live to eternity. To paraphrase Shakespeare, "Age cannot wither him, nor custom stale his infinite variety." In fact, I had to correct a few conversion errors in the above text, passages which were rendered perfectly by the Google service. I fed Emery's first sentence to the normal Google search and it gave me a link to a digital copy of the book in Google books. That means Google couldn't match the photo in the book, but it could match the text. This post might not have much to do with image recognition, but it at least has something to do with Marshall and Emery. In contrast to last month's (No) May Yahoos, -- 'May Yahoos continue in June. If not, we'll have more Google News.' -- Yahoo chess stories for the month of June were a mixed bag. 2018-06-11: When it comes to the international chess game, Trump is a master (yahoo.com). That's the Yahoo version of the first headline, which continued, 'When Fisher made that move'... Any time a chess story mentions 'Fisher' in place of 'Fischer', it loses me immediately. As so often happens with Yahoo stories, it was just a stub leading to the original. Bishop to e6. That was the name of the 17th move in what is commonly referred to as “The Game of the Century” when, on Oct. 17, 1956, 13-year-old Bobby Fischer beat chess master Donald Byrne, 26, and turned the chess world upside down. Fischer’s move offered a sacrifice of his queen, which Byrne accepted, but then Fischer followed with a series of planned, precise attack moves ultimately leading to a checkmate. When Fisher made that move, those familiar with chess who were stuck in conventional paradigms, common strategies and established protocols gasped in horror as they clearly realized the young prodigy had lost his mind, his nerve, or both. Since he has taken office, President Trump not only has metaphorically translated Fischer’s insightful, creative boldness into his foreign policy, he has done so in cascading tiles of fresh, previously unimaginable moves. If you're interested in further speculation about Trump's ability to play chess, see last week's post Analyze Your Own Images. If you're interested in speculation about the events surrounding the referenced chess game, see Donald Byrne vs Robert James Fischer; "The Game of the Century"; Third Rosenwald Trophy (1956), New York (chessgames.com). For the second headline, let's skip the Yahoo stub and jump directly to the real story. It echoes another Yahoo story that I used twice on my World Chess Championship blog: Hijab Hubbub (October 2016), and Hijab Hubris (ditto). 2018-06-13: Chess player pulls out of championship over Iran's rules. In 2016, the story's protagonist was Nazi Paikidze, the reigning U.S. Women's Champion at the time. This time it's an Indian player. Conscience knows no national boundaries. A female Indian chess player said Wednesday she has decided to not participate in an Asian championship being held in Iran next month because she could not comply with an Iranian rule requiring women participants to wear a headscarf. Soumya Swaminathan, a former world junior girls champion, said she found the Iranian law to be in direct violation of her rights and the only way to protest that was to not go to Iran. The Asian Nations Cup Chess Championship is scheduled to be held in Hamadan, Iran. The next story isn't a chess story at all, but it uses a chess image which I liked and which appears in the headline shown above. It's a stock photo from Getty Images showing stacked coins that resemble a chess piece. If the title of the story is any guide, it's a chess King. Even more challenging would be coins stacked to resemble a chess Knight. I would have supplemented those with a story about a future Candidate for the World Championship. There are never enough stories in the mainstream press about world class chess players. How Many Pawns for a Rook? The diagram below shows an endgame position I reached in a recent chess960 game. I was playing White and although it looks like I'm down boatloads of material, I'm about to recover some of it. Looking at the material on the board, it's one of the most unbalanced positions I've ever encountered. The game continued 27.Rxg6+ Rc6 28.Rxc6+ Kxc6 29.Qg6+. Here I was expecting 29...Kb7 30.Qxg7+, when White has a Queen and six Pawns against a Queen and Rook. The game was a correspondence game where engines were permitted and I had spent considerable time studying this position before deciding to play the line. The further variations went beyond the horizon of the engines I was using, so I was on my own to make an evaluation. First observation: Black is going to recover at least one Pawn, maybe two. Second observation: The White Pawns are too far back to present an immediate threat to Black. Third observation: The Black King has no cover and is exposed to long sequences of checks by the White Queen. All in all, it promised to be an interesting endgame where any result was possible. After 29.Qg6+, my opponent played 29...Kb5, and offered a draw. I realized that as long as he didn't play ...Kb7, White has nothing more than a perpetual check by the Queen on the 5th and 6th ranks. I reluctantly agreed to the draw and moved on to my other games. How to discover the most relevant threads? I started by looking at recent threads with a high number of responses. 2018-06-03: I have 10x1080ti I want to contribute; what's the optimal way to run it? 2018-06-23: Who entered Leela into WCCC? Bad idea! Leela was placed into the lowest of the TCEC qualifying events, Division 4. As shown in the crosstable that accompanied that post, Leela finished last in the division by a wide margin. Season 12 has now progressed to the final stage, where Stockfish and Komodo have already completed 40 games with the score +8-4=28 in favor of Stockfish. Extrapolating this result to the 100 games planned for the match means that Stockfish will win by something like +20-10=70. The action and chat can still be followed at TCEC - Live Mode, although this currently redirects to a new (temporary?) domain with a redesigned interface. I'll come back to season 12 when it's over. Interesting insights. I feel it should called 'The Philosophy of Chess' though. Sociology, Psychology, Philosophy -- take your pick. This video explores the psychology of chess, especially with respect to how chess can offer us valuable life-lessons. 12:47 - Final Lesson: "Love while the night still hides the withering dawn"
For more about the speaker in the video, see Eric Dodson, Ph.D., Department of Psychology, College of Social Sciences, University of West Georgia. After I uploaded the image, Google declared, 'Best guess for this image: donald trump chess', where the first link (from 'About 25.270.000.000 results'!) was 'Does Donald Trump play chess?' (quora.com). A number of APIs have recently been developed that aim to allow organizations to glean insights from images without requiring in-house computer vision or machine learning expertise. Google Cloud Vision API enables developers to understand the content of an image by encapsulating powerful machine learning models in an easy to use REST API. It quickly classifies images into thousands of categories (e.g., "sailboat", "lion", "Eiffel Tower"), detects individual objects and faces within images, and finds and reads printed words contained within images. I fed last week's Donald Trump 3D-chess image to 'Try the API' and it returned the following analysis. I would say, 'Spoof: Very likely' and I have no idea where 'Racy: Possible' comes from. As for the last tab, 'JSON', this returned a text list to import the image's attributes into another process. Who knew there was so much information in a single photo? Google knew. Google knows everything. No, I'm not talking about achieving a 2700 rating. I'm talking about post no.2700 on this blog. That distinction belongs to my previous post, Chess Lions in Leuven, which makes this current post no.2701. Before I achieve a 2700 rating, I first have to reach 2300, but since I stopped playing competitive crossboard chess many years ago, that's not going to happen anytime soon. How many players in the world are rated 2700? I blew the dust off my collection of historical rating files and counted the players for 2018. While I was doing that, I also counted them on the first international rating list in 1971 and at the start of every decade since then (1980, 1990, etc. ), where the lists were all published in January of the respective year. The following chart shows the counts I recorded. For good measure, I added a similar count of 2600 players (which includes >2700). On the 2700 side, the only player breaking the barrier in 1971 was a certain 'Fischer, Robert James' (USA) at 2760. Second on the list was 'Spassky, Boris V' (URS) at 2690. The two 2700-players in 1980 were 'Karpov,An.' (USR) 2725, and 'Tal' (USR) 2705. In January 2018, there were four players rated 2800+, 40 rated 2700-2799, and 211 rated 2600-2699. The increase in world class players through the decades has not been linear. There were more 2600 players in 1971 than in 1980, and the largest increase in both rating bands took place in the decade 2000-2010. A few years ago, in Next Short Draw: 2750 (March 2013), I was critical of GM Wesley So for manipulating his rating to break through 2700 Elo. According to his Rating Progress Chart (ratings.fide.com), he subsequently broke through 2800 in January 2017. A 2800 FIDE rating is an amazing achievement for any player. To break 2800, all I have to do is write another 100 posts. The month of June means the end of spring, the beginning of summer, and the Grand Chess Tour in Belgium. According to my report from two years ago, Chess on Belgian News (June 2016), the recent rapid/blitz tournament was the third running of the Belgian leg of the event, formally dubbed 'Your Next Move'. The World Chess Hall of Fame (WCHOF) celebrates one of the world's oldest and best-loved games through vibrant, engaging exhibitions and creative programming. A not-for-profit, collecting institution situated in the heart of Saint Louis, Missouri, the WCHOF houses both the U.S. and World Chess Halls of Fame, which honor the accomplishments of the game's finest players and contributors. The organization presents exhibitions that explore the history of the game, as well as its remarkable impact on arts and culture. These unique shows and programs are designed to appeal to both the chess novice and expert, defying expectations and enhancing knowledge of the game. Along with those of its sister organization, the Saint Louis Chess Club, the WCHOF's activities have distinguished Saint Louis as a national and international chess destination. 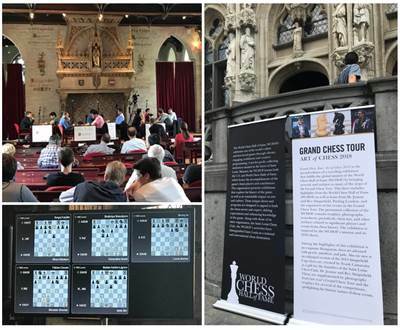 Grand Chess Tour: Art of Chess 2018 is the second edition of a traveling exhibition that fulfills the global mission of the World Chess Hall of Fame (WCHOF) by bringing artwork and artifacts to many of the stops of the Grand Chess Tour. This show includes highlights from the World Chess Hall of Fame (WCHOF) as well as loans from Dr. Jeanne and Rex Sinquefield, Purling London, and the organizers of the events in the Grand Chess Tour. The permanent collection of the WCHOF contains trophies, photographs, score sheets, periodicals, chess sets, and other artifacts related to significant players and events from chess history. The exhibition is inspired by the WCHOF's mission and its 2018 shows. Among the highlights of this exhibition is an exquisite Hungarian chess set adorned with pearls, amethyst, and jade. Also on view is an enlarged version of the 2013 Sinquefield Cup chess set, created by Frank Camaratta as a gift for the founders of the Saint Louis Chess Club, Dr. Jeanne and Rex Sinquefield. 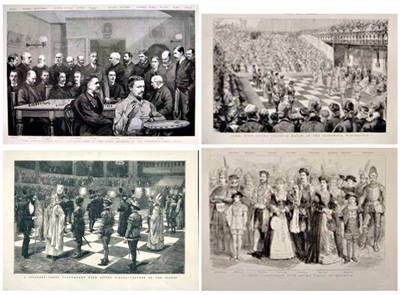 These are supplemented by photography from last year's Grand Chess Tour and the trophies for several of the competitions, spotlighting the historic nature of these events. Images from left to right: [top of the poster] Magnus Carlsen Winner of the 2017 Grand Chess Tour, 2017, Photo by Lennart Ootes;  Sinquefield Cup Imperial Chessmen, 2018, Photo by Michael DeFilippo;  Fabiano Caruana After Winning the 2018 Candidates Tournament, Photo by Nick Dunaevsky, March 28, 2018.  Collection of the World Chess Hall of Fame, (c) Nick Dunaevsky, official photographer of World Chess. Wesley So won this year's Leuven YNM event. Details can be found on 2018 Your Next Move (grandchesstour.org). Net has been replaced with a new bootstrap net with 50 move rule normalization and learnable batch normalization beta bias. It will likely be weaker to start but will hopefully grow stronger quickly. What does that mean? Maybe I'd better retrace my steps, because it looks like I missed something. I'll start by looking at the links on LCZero's left sidebar (in order). Welcome to the Leela Chess Zero wiki! That page looks like the instructions I followed for Installing Leela (21 May 2018), so at least I'm on familiar ground. *** Github: This leads to the same page that I just looked at: github.com/LeelaChessZero/. *** LCZero Chat: Here under #dev-log, I found the same message that is on LCZero's main page: 'Net has been replaced with a new bootstrap net [...]'. Signed, Chad - 10/06/2018. Where's Leela? The main Github page has moved, but the rest remains as before. The chat looks to be a preliminary source of technical discussion to the forum. Starting with last month's post, The Chess Waste Land, I moved the Featured Flickr Photo series from a fortnightly to a monthly schedule. This gave me plenty of images on my short list from which to choose. I chose the following. The world of chess © Flickr user jaci XIII under Creative Commons. After: Rafal Olbinski. Chess photo is wallpaper. Out of curiosity, I fed the image to the images.google.com service I discussed in Search Your Own Images. It told me, 'Best guess for this image: 3d chess'. One of the links for the image went to 4 Games Like 3D Chess for Linux (topbestalternatives.com), where there is a well known image of chess pieces on a sphere similar to the featured photo above. In fact, further inspection of the two images convinced me that they were essentially the same. The other image is red instead of blue, but the same pieces are all on the same squares of the sphere. That must be the wallpaper mentioned in the description. Feeding the red image into images.google.com told me 'Best guess for this image: impossible backgrounds'. Can't argue with that. Could a network recognize that this is not a photo? Or (without being told) that it shows dogs. My first step should probably be to make some sort of survey of what software and services are available. Both of these are accessed by clicking the camera icon in the search box on images.google.com. I fed it the link for the painting/photo used in 'NN for Chess Images', and it gave me three results. Two of these ('Best guess for this image') were pages about Dalmatian dogs (well done, Google!) and the third was a link to the home page for this blog, where the original post is still displayed because it is among the most recent. The results also included a dozen thumbnails for 'Visually similar images'. None of the thumbnails showed a Dalmatian, but all of them had the same sort of pink background shown in my original photo. (Remember Chess in the Pink, April 2018?) Unfortunately, I can't give a link to the Google results, because it is based on some sort of encryption technique that probably includes details about its origin (i.e. me). After that little experiment, I fed Google image search the link to the image used in 'Mystery Painting' on eBay (June 2017). This is a painting that pops up occasionally in different places, but where I have been unable to determine its origin. This time the Google results could find nothing more interesting about the image than that it showed a 'picture frame'. Under 'Visually similar images', the dozen thumbnails displayed different paintings in picture frames. Given a similar image used in my original Mystery Painting (December 2007), Google determined that it showed 'edelen middeleeuwen', which another Google service translates from Dutch to 'nobles middle ages', which I translate to 'nobles from the Middle Age'. Along with a couple of links to Dutch-language pages, the thumbnails showed one more copy of my original image. The Google image search clearly has limitations on its usefulness. As a final test I used an image which has been sitting in my 'Junk' directory for over a year, not because the image is junk, but because I didn't know what to do with it. 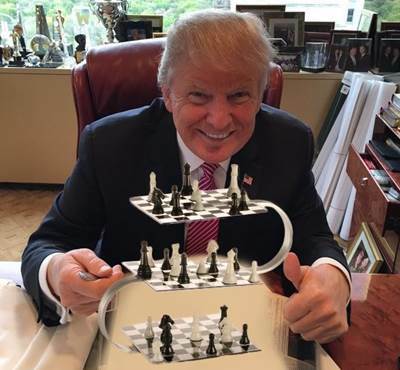 After I uploaded the image, Google declared, 'Best guess for this image: donald trump chess', where the first link (from 'About 25.270.000.000 results'!) was Does Donald Trump play chess? (quora.com). About half of the thumbnails were variations on my uploaded image; the other half were people playing chess, including two showing Garry Kasparov. The Trump image is obviously photoshopped, where a Star Trek 3D chess set has been pasted over whatever Trump was holding in his hands. According to a database I constructed, my collection of images (mostly) from eBay has about 20.000 examples. Since uploading a small percentage of these one-by-one would be an exercise in tedium, I'll have to find a better solution. Dear US Chess Voting Member, Due to an error by our mailing agent, your Executive Board Election Ballot was not mailed to you at the scheduled time. Your ballot has now been mailed to you as of Friday, June 30 via overnight or expedited mail (depending on your location). The deadline for receipt of your marked ballot is Tuesday, July 18, by 3 p.m. CDT. Full instructions for marking and returning your ballot are included in the envelope being sent to you. Our apologies for any inconvenience. Whatever went wrong the first time became a double blunder, because I never received the second ballot either. I was reminded of this when I received the following postcard earlier this week. Garry and Rex have teamed up to make a difference for American Chess by organizing and supporting premier chess events. Today they have issued this joint statement: "We are pleased with our partnership with US Chess. To keep the positive momentum for Chess, We recommend and endorse the executive board members and candidates with track records of positive achievements." This year there are four candidates for two positions. 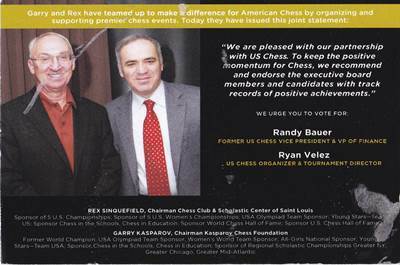 I don't follow U.S. chess politics closely enough to know why the two recommended candidates have better 'track records of positive achievements' than the other two candidates, but what's good enough for Rex Sinquefield and Garry Kasparov is good enough for me. With an American player competing for the World Championship in November, U.S. chess needs the strongest leadership possible. Will I receive a ballot this time? Later: Oops! Looks like I goofed. When I copied the title from the 2015 EB post to this post, I forgot that the U.S. chess federation had since changed its name from USCF to USChess. Strike one! 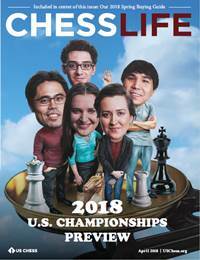 Starting with the April 2018 issue, Chess Life (CL) has a new online feature, 'Cover Stories with Chess Life'. These are presented as a podcast interview with the author conducted by CL's editor, Daniel Lucas. The first talk was with FM Mike Klein of Chess.com, who wrote the cover story introduced on the left ('cover art by Paul Dickinson'). That first podcast, plus the two podcasts conducted for the May and June issues of CL (with Al Lawrence and GM Ian Rogers), can be found on Podcast Archives (uschess.org). I'm a big fan of podcasts, and after The Week in Podcasts (February 2018), this is the second time this year I've posted about them. Maybe that's because I also like listening to the radio while I'm doing something else. Having said that, I have a couple of problems with the podcast format in general. The first problem is that podcasts require concentration. I can't concentrate on a second task -- like writing a blog post -- while I'm listening to a podcast. Driving also requires some concentration, as does manual work like painting a room, but listening to music at the same time takes no concentration. Listening to a talk show or a news program occasionally requires concentration ('Wait a moment. What did they just say? '), but my focus can shift rapidly because the primary task, like driving, doesn't always require full concentration. I simply can't do two simultaneous tasks that both require near-full concentration. Why not just concentrate on the podcast? Because listening to a podcast is not like watching a video. Unlike a video, a podcast doesn't engage my eyes, which means that my visual attention is constantly wandering to something else. A transcript might be useful. The second problem is that podcasts are difficult to quote, although here I have the same problem with videos. If I want to introduce a short quote from an audio source into a blog post, I have to listen to the audio and write what I think I'm hearing, then iterate the process several times to make sure the quote is accurate. Natural-language processing (NLP) is an area of computer science and artificial intelligence concerned with the interactions between computers and human (natural) languages, in particular how to program computers to process and analyze large amounts of natural language data. For more about available speech-to-text tools, I'll have to make a survey and actually try some of them. And AlphaGo Master begat AlphaGo Zero, and AlphaGo Zero begat AlphaZero, and AlphaZero begat Leela -- at least according to The Lineage of AlphaZero (January 2018) and Understanding Leela (June 2018). And behind all of this begetting was David Silver of Google's DeepMind. If you're as out of the loop as I am, you might like to know that NIPS is shorthand for 'Conference and Workshop on Neural Information Processing Systems'. Have you ever felt like smashing your chess set with a hammer? How about smashing your board? These guys did and they weren't even angry -- maybe just a little mad. You've never seen a chess board like this - It plays against you! We have to figure out how this thing works! WARNING: Cutting things open is dangerous. We do not recommend you try what we do! [...] Remember our motto "We cut things open so you don't have to", so we do not recommend you try anything we do. The board is from Square Off ('Connecting the world on a telerobotic chessboard'). An NN for Chess Images? After getting my introduction to AI in It's Much More than Chess, can I make any practical use of the knowledge? I'm already following the chess playing aspect -- as in Understanding Leela -- but there must be other angles involving chess. In yesterday's post Chess in The Graphic, I mentioned my archive of chess images. Maybe I could do something with that? For starters, how about building and training an NN to tell the difference between a photo and a drawing; and maybe throw in a scanned text as a third possibility. Take the following image as an example. This is a fantastic 20"x24" hand painted, unstretched oil on canvas. 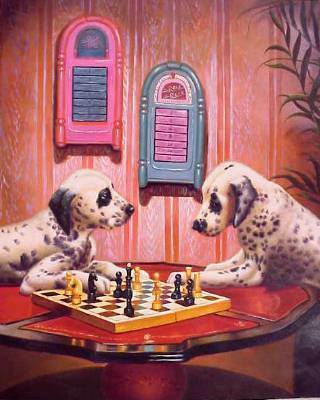 The painting depicts two dalmation dogs playing chess. The oil is unsigned. "The Sixteen Leading Chess Players of the World" from the July 17, 1886 issue of The Graphic. [...] I found three copies of the image in my archive. The best copy showed that the 1886 original had the names and nationalities of the players listed outside the border of the image. The best associated text copied that information. While I was browsing the archive I found nearly a dozen other images from The Graphic. Here are four of them. The fellow in the foreground of the first image is J.H.Blackburne, apparently conducting a blindfold simul. As for the three 'Living Pieces' images, I hope my legend is correct, because I discovered some contradictory text attached to the different images. I could have resolved these discrepancies with digital copies of the original issues of The Graphic. Here, for example, is a link to the British Newspaper Archive ('in partnership with the British Library') showing the issue containing the image from '1886 Photoshopped Illustration': Results | From 17th Jul 1886 | The Graphic. It's a subscription site and I didn't want to pay just to resolve some minor issues, so I'll leave that for a time when I have more serious research to do. 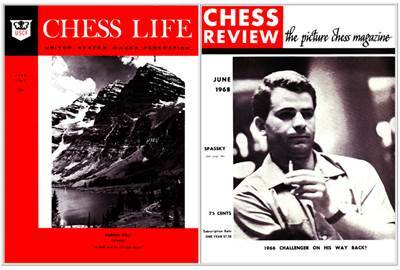 Fifty years ago the covers of the two leading American chess magazines featured the nation's premier open tournament and the world's premier qualifying tournament. For the previous month's covers, see May 1968 'On the Cover'. The first time on this blog that we saw the venue of the U.S. Open was July 1964 'On the Cover' ('On to Boston!'). This was followed by 'On the Cover' for May 1965 ('A Caribbean Chess Holiday! '), and May 1967 (Atlanta). In 1966, the cover for the Open was usurped by other tournaments. Boris Spassky of the Soviet Union is leading the prospective challengers in the elimination matches. The magazine continued, 'The first round of Challengers Matches has probably ended.' Of the four quarterfinal matches for the 1967-69 Candidates Matches, Larsen - Portisch (+2-2=3 each) was still unfinished at the time the June issue was published. Suddenly Black played 34...Qf4, placing the Queen en prise to two pieces. Give that move '??'. I don't understand what happened here and will look into it another time. The above game contains a lot of seemingly absurd moves. Does anybody know why this is happening? Training games have randomly selected moves to enable learning. If you want to analyse games played between networks please look for them here: lczero.org/matches. So training games are the first step in the Leela heirarchy; matches are a second step. Got it. The same post pointed to another introductory resource: leela-chess/wiki/FAQ (github.com). [Self-play training games] are how Leela Chess Zero trains herself. They are played with extra randomness turned on so it can discover new good (and bad) moves. This means the quality of these games is lower than the match games. There are also many technical threads that discuss different configurations for the Leela client or that delve into the structure of the network(s). Let's look at those another time. Starting with the previous edition of Top eBay Chess Items by Price, I switched the long-running series (first post March 2010) from a fortnightly to a monthly schedule. Since that previous post -- Chess Art, Paris 1925 -- appeared at the beginning of May, I had eBay auctions from the entire month of May to choose from. Did that mean I had double the number of interesting items on my short list? Not exactly. Of course, there are always auctions for collector chess sets or chess computers, but they have to be especially unusual to catch my attention. In a decidedly uninspiring month, the item pictured below grabbed the lion's share of that attention. Titled 'Chess Life and Review - 2 disk DVD collection Chess Software', subtitled 'Brand New', it sold for US $582.04 ('+$19.60 shipping'), Buy-It-Now. Here is your chance to get 42 years worth of Chess Magazines at a cost of less than $1.00 per year! ...which is obviously not true for the eBay item. The seller of that item has more than 100 'Neutral' or 'Negative' feedback comments, some of which mention that an item sold on eBay was shipped using Amazon Prime. Like many once-interesting web ideas, eBay eventually evolved into a giant swamp. The chess DVDs just add to the widespread muck. By coincidence, while I was preparing the recent post, An 1886 Photoshopped Illustration, where I mentioned that 'I've been downloading old copies of The Chess Journalist (TCJ)', I noticed that the December 2006 issue of the TCJ credited the existence of the scanned CL/CRs to Tim Tobiason. He seems to have been a colorful character in several ways, but this isn't the time or place to repeat stories that can be found elsewhere on the web. It is his misfortune that while the original magazines are protected by copyright, his scans aren't protected by a second copyright because they don't represent creative work. He seems to have been a colorful character in several ways, but this isn't the time or place to repeat stories that can be found elsewhere on the web. ...the Armchair Warrior found both the time and the place: Tim Tobiason - A Colorful Chess Character (xpertchesslessons.wordpress.com). In five courses, you will learn the foundations of Deep Learning, understand how to build neural networks, and learn how to lead successful machine learning projects. You will learn about Convolutional networks, RNNs, LSTM, Adam, Dropout, BatchNorm, Xavier/He initialization, and more. You will work on case studies from health care, autonomous driving, sign language reading, music generation, and natural language processing. You will master not only the theory, but also see how it is applied in industry. You will practice all these ideas in Python and in TensorFlow, which we will teach. One of the big advantages of Coursera is that the courses can be audited for free. Although all material for the courses -- videos, quizzes, programming assignments, and forums -- is available at no cost, the quizzes aren't graded without payment and there is no certificate issued for completing a course. Not having done any programming in more than 20 years, I was concerned that my skills were out of date, but there was plenty of support offered for both Python and TensorFlow (Keras is also used) and I had no trouble completing the assignments. This was partly due to the cookie-cutter structure of the exercises and to forum discussions by previous students that shed sufficient light on the knottiest problems. It also helped to know some math, particularly linear algebra and calculus. The courses are the work of Andrew Ng (wikipedia.org) and his company, Deeplearning.ai. After noting a few weeks ago that AI and all it entails is A Transformational Technology (May 2018), I'm glad I understand the subject much better than I did six months ago. A key question I had going into this endeavor was 'Why is AI taking off now?' People have been talking about it for decades, but it was always just around the corner. What changed to make it reality? An important driver has been 'big data'. We now have so much digital data with huge portions of it correctly cataloged and labeled that we have the means to explore digital relationships that were inaccessible in the past. We also have algorithms to process big data that, not so long ago, were unknown or undeveloped. Most modern AI is based on the same set of related algorithms. Computing hardware has progressed in parallel with the development of those algorithms allowing for their practical implementation. The necessary support for vectorization in both processors and software development tools was previously missing. Finally, the impetus for capturing big data and developing big tools is big money. AI first revolutionized the commercial endeavor of selling ads and is now gradually creeping into every commercial activity on the planet.